Magazine advertising commands high levels of consumer attention and is good value relative to other media channels, yet there is a "disconnect" because some advertisers are underinvesting in the medium. That’s according to Magnetic, the trade body for the magazine sector, which has published a new report, Pay Attention: Magazines’ Role in the Media Mix, to show that magazine advertising is "underrated" and "delivers high-quality attention for exceptional value". The research claims that magazine advertising is cost-effective by showing the effectiveness of magazines compared with all media channels and the price of each medium on a cost per thousand (CPT) basis. "If you take price into consideration, you actually pay less for more attention with magazines," the report said. 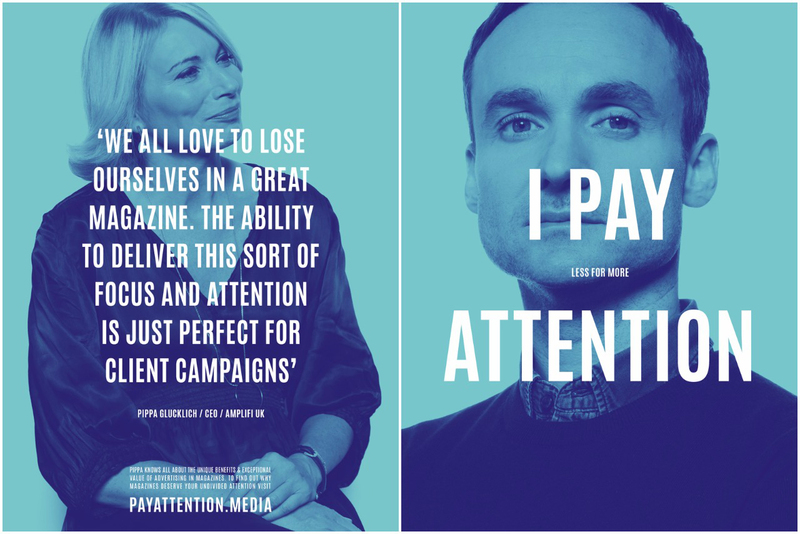 Magnetic has launched its first ad campaign to support its research, with ads featuring industry leaders and thinkers and the message: "I pay less for more attention" appearing on special coverwraps of leading Cosmopolitan, Empire, Grazia, Radio Times, Woman & Home, Cyclist and Time Out. Among those who feature in the campaign are Gavin Sheppard, chief marketing officer at Smart Energy; Pippa Glucklich, chief executive of Dentsu Aegis Network’s Amplifi UK; Dino Myers-Lamptey, managing director of MullenLowe Mediahub; Tom George, chief executive of Group M; Mike Florence, chief strategy officer of PHD; and Jenny Biggam, founder of the7stars. The special issues will be distributed in media agencies in London and Manchester and directly to marketers. Brand design studio D.Studio created the print and digital ads. Sue Todd, chief executive of Magnetic, said: "This is first time the magazine industry has come together under one message, so we wanted it to be attention-grabbing. "There has been an increasing disconnect between the body of evidence that shows the effectiveness of magazines and the perceptions of their role on the plan within agencies. 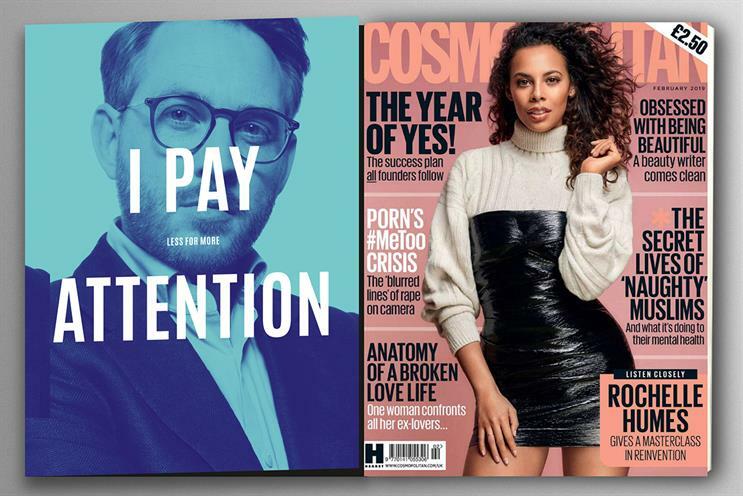 "This campaign shows the unique benefits of magazine media – trusted, relevant and positive environments in which readers pay attention to the content and, most importantly, the advertising." Magnetic worked with Bournemouth University and media agency PHD on its study into attention. 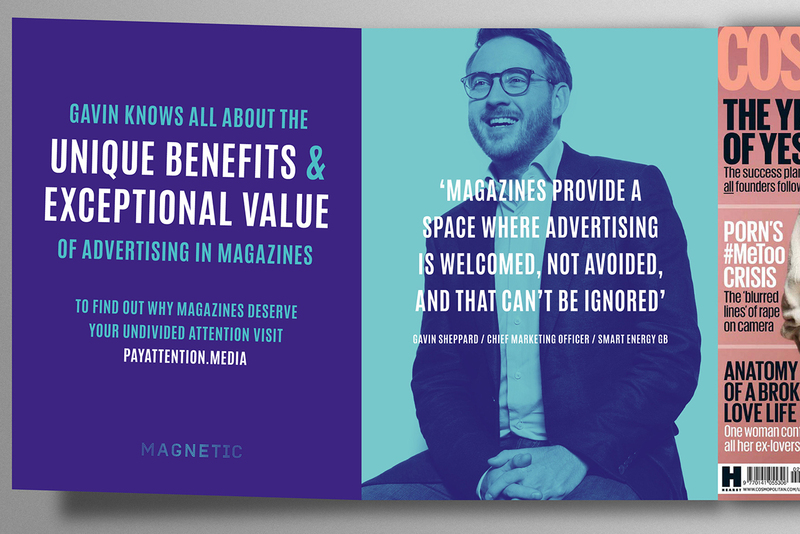 Magazines are a "high-attention environment" because they "provide a positive content and advertising experience", "a relevant context that enhances receptivity to advertising" and "a highly trusted environment", according to Magnetic. The body added: "With magazines, advertising is not rejected, it is seen as a positive part of the experience." Magnetic said a catalyst for its study was research last year from Ebiquity and Radiocentre that showed a perception gap because marketers and agencies underestimated the effectiveness of established media such as radio and magazines. The organisation went on to compare the effectiveness of each medium and the cost on a CPT basis by using Warc and Ebiquity data. It showed magazines "consistently" feature in the middle of the range on CPT compared with cinema and TV at the higher end and radio and social media at the lower end. Then it compared cost and effectiveness to show magazines have "one of the highest levels of attention to advertising, second only to cinema, but are more competitive on cost". Magazines have "the lowest cost" for two key demographics, 16- to 34-year-olds and housewives with children, and are among the lowest for ABC1s after newspapers, according to Magnetic. Florence said: "There is a huge gap in terms of opportunity for clients to reach audiences in ‘high attention to advertising’ contexts and I think that’s a real shame. The whole industry is undervaluing attention to advertising that magazines can deliver."